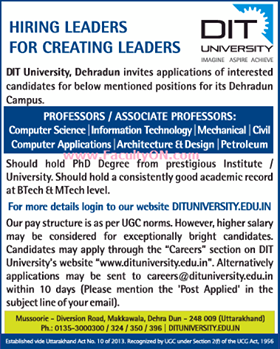 DIT University, Dehradun has advertised in THE TIMES OF INDIA newspaper for the recruitment of Professor plus Associate Professor job vacancies. Interested and eligible job aspirants are requested to apply with in 10 days. Check out further more details below. College Profile: DIT University is designed to provide holistic education, enabling students to stand on their own feet. The focus is always on promotion of self-learning and honing talents to ensure the all-round development amongst our students.